America is getting ready to celebrate its birthday next week on July 4th marking 242 years since the signing of the Declaration of Independence in 1776. In the spirit of the holiday, I thought I’d take a look at the “Made in the U.S.A.” movement and the state of modern manufacturing in America. Over the past several years, we’ve seen a rebound of the American manufacturing market and it doesn’t look like it’s slowing down anytime soon with Trump’s pro-manufacturing and America first policies. In fact, 2017 was the best year in U.S. manufacturing production since 2011. Although the threat of recent Trade War has caused some volatility in the U.S. manufacturing movement, here’s a look at the top reasons manufacturing is continuing to make a comeback stateside. “Made in the USA” Brand Value. What started as a cute catchphrase has become a major marketing campaign for many brands. The reasons consumers shop US-made products can range from not wanting to exploit the workforce in developing countries to shopping American made goods as an act of Patriotism. Either way, the end result is a surge in sales of “Made in the USA” products. Increasing Wages in Developing Countries. One of the primary forces behind offshoring was the low wages manufacturing could pay in developing countries, however as these developing countries increase wages the allure of producing goods overseas is diminishing especially when you factor in the shipping costs to bring the products produced abroad back to the U.S. to be sold. 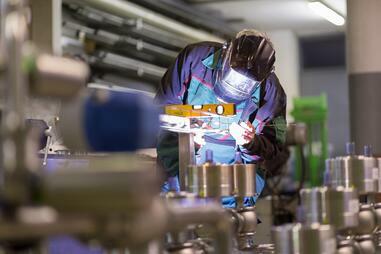 Can VISIBILITY ERP help your manufacturing business thrive in the U.S. manufacturing market? Click here to learn more about our next generation solution VISIBILITY 2018 or click the button below to enter your contact details to be contacted by a Visibility representative.